I started with two coats of OPI – If you Moust you Moust on my ring finger and thumb. 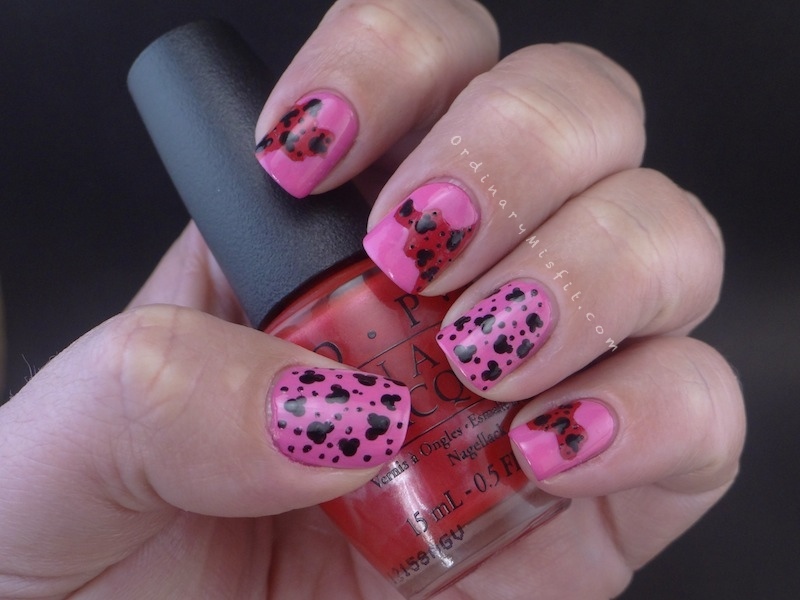 I then had 2 coats of OPI – The Color of Minnie on the rest of my fingers. The fingers that were in The Color of Minnie were taped off in a random pattern (I tried to make it look a bit ‘torn’) and then I used If you Moust you Moust over the tape. I took the tape of immediate after painting. Once all that was dry I took Sinful Colors – Black is Black and my dotting tool and started to make the Mickey head shapes on my ring finger and thumb. I then also made the same shapes on the red parts of the other nails. I also made tiny tiny little polka dots in between the Mickey shapes. It didn’t come out exactly the way I was going for but it was still cute. I topped it all off with a nice topcoat. So what do you think? This was something that was very quick and easy to do as well. The longest part was waiting for the polish to dry to tape it. I love Mickey Mouse so I though it was cute. 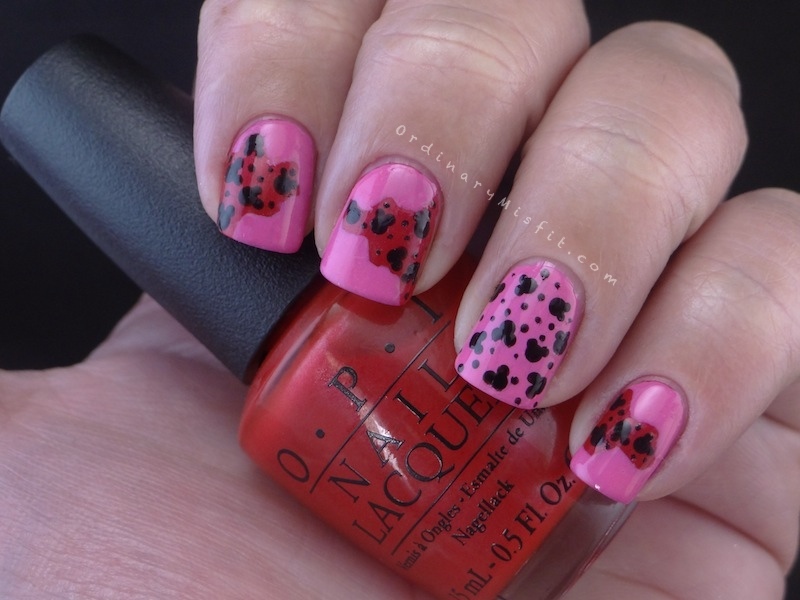 Of course the polishes being from the OPI Vintage Minnie Mouse collection makes this all go together perfectly! Oh Mickey you’re so fine, you’re so fine you blow my mind, hey Mickey! Lol. It is too beautiful for words! Totally looooovvvveeee it! Really pretty! Ooooh, I love this! Disney themed nails, Minnie inspired polishes! It hits all my happy spots! LOVE! Pink shmink! This is adorable! i freaken love this! It is so cute and sassy!!! Thanks so much V!!!! yay! Cute! Very creative! I’ll have to remember the “Mickey Head” idea for the next time I go to Disneyland! My best friend lives in the area and is a HUGE Disney geek, and I don’t think I’ve been since Christmas 2011.